HOW MUCH DOES CUB SCOUTS COST? A portion of these fees pay for our national charter, your son’s Boys Life magazine, and some of the Pack’s costs for patches and operating expenses. New scouts should bring a check made payable to Pack 108 to the Pack Meeting at Camp Ockanickon on September 13. WHAT DOES THE PACK PROVIDE? All New Scouts receive a Green Pack 108 Class B T-Shirt for field trips, certain outdoor activities, and informal gatherings, a scout handbook, a neckerchief, a pinewood derby car, and earned badges and awards. Each family is responsible for purchasing their son a Class A uniform. The Pack also has certain events and trips that are charged on a user fee basis. How old are Cub Scouts? Kindergarten to 5th grade. Because we are recruiting new scouts, this year’s kindergarten, first and second grade classes are the perfect age to start, but third and fourth grade students can quickly catch-up too. Scouts will be grouped in “Dens” by their age. We are sensitive to the Scout’s busy lives. We typically hold 1 to 2 Den meetings a month at various locations, and 1 Pack meeting a month at the SML gym. The Pack will also have several optional field trips throughout the year. Can my son play sports and Cub Scouts? Yes, almost all of our boys play baseball, soccer, basketball, and other sports, and actively participate in Cub Scouts. When possible, we try to schedule certain activities around sports, but conflicts can happen. What will my son learn? resourcefulness. Moreover, unlike sports where you just watch your son play, Cub Scouts is a family experience that will provide your family with a vehicle to teach your son life lessons that are important to you. How does Pack 108 help the community? We make care packages for our troops, donate food for the needy, collect toys for area children, decorate graves for our fallen military heroes, and hopefully serve as model citizens that lead by example. As part of your dues, the Pack provides each Scout with a Scout Handbook, a Green Class B Shirt (to be worn at certain outdoor and less formal functions) and a neckerchief. Each family will need to purchase a blue Class A Shirt, the appropriate hat for your son’s rank (Tiger, Wolf, Bear, etc. 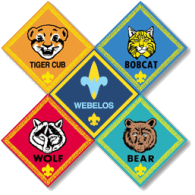 ), corresponding neckerchief slide, Cub Scout belt, blue pants, and patches to be sewn onto the shirt (Red Pack Number 108, Garden State Council Patch, and Den Number Patch). These items can be purchased online at http://www.scoutstuff.org/, the Rowan Scout Resource Center, 693 Rancocas Road, Westampton, NJ 08060, or at Stones Camping World, 127 N. Rt. 73, Berlin, NJ 08009. Note: The Garden State Council Patch may not be available online, but the Pack can pick one up this patch for any family that wants to order everything else online. New Scouts will need to have their uniforms by the October Pack Meeting. Optional Red Vests (or brag rags) may also be purchased to show off special patches earned that are not displayed on the uniform.